Packed with nutrients and endlessly, easily customizable, grain bowls are having a moment for a reason. Here's how to make them at home. 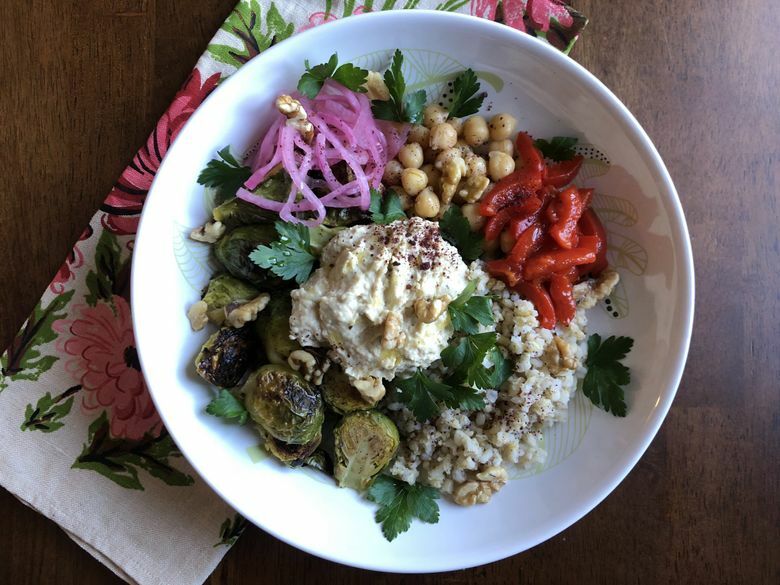 Grain bowls have been increasingly “on trend” for years now — as has food in bowls, generally — and it’s not hard to find places in Seattle serving them up for a quick, tasty, nutritious grab-and-go or dine-in meal. But grain bowls are also ideally suited for quick at-home meals — and not just because they are a great way to reuse leftovers. Grain bowls follow a formula instead of a recipe (although some components may involve a recipe). Basically it’s this: whole grain + protein + vegetables + sauce/dressing + garnish = grain bowl. Here’s how the components break down. Whole grain: Choose from quinoa, emmer farro, einkorn, spelt, whole-grain sorghum (as opposed to pearled), whole-grain barley (again, not pearled), bulgur wheat, freekeh, Kamut wheat, brown rice, black rice, red rice and wild rice. Protein: Go plant-based with beans (white, black, pinto, etc. ), lentils (French green or black beluga), chickpeas, edamame, baked tofu, or tempeh. Or go omnivorous with roasted chicken, leftover steak or fish, or even canned tuna or salmon. Vegetables: Prepare a batch of roasted Brussels sprouts, broccoli, cauliflower, asparagus, fennel, and so on, but also add in some chopped, shredded, or thinly-sliced raw veggies. Think red or green cabbage, carrots, dark leafy greens (spinach, kale, chard, mustard greens, shredded Brussels sprouts — anything that strikes your fancy). Sauce/dressing: This can be lemon or lime juice, vinegar, olive or nut oil (walnut and hazelnut are especially good), hummus, garlic-tahini dressing, pesto, hot sauce, soy sauce. If you are packing your grain bowl to go, it can handle being dressed in advance. Garnishes: These include healthy fats from chopped tree nuts (walnuts, almonds, pistachios, pecans, etc. ), peanuts, seeds (sunflower, pumpkin, sesame, etc. ), sliced or diced avocado, as well as flavor-rich elements like olives, capers, fresh herbs, spices, cheese and pickled onion or radish. Optional extras: Get creative! A few ideas: hard-boiled eggs, cubed and roasted sweet potatoes or butternut squash, and jarred or canned peppers (roasted red peppers, banana peppers, jalapeños). Prep ingredients in advance. If you try to prepare all the parts of a grain bowl shortly before you plan to eat it, I guarantee it will be the last bowl you ever try to make at home. Cook grains and beans, roast vegetables, prepare ingredients like hummus and pickled onions, wash greens, and even pre-chop or shred some raw veggie ingredients on the weekend for easy weekday meals. Let family members customize their bowls. 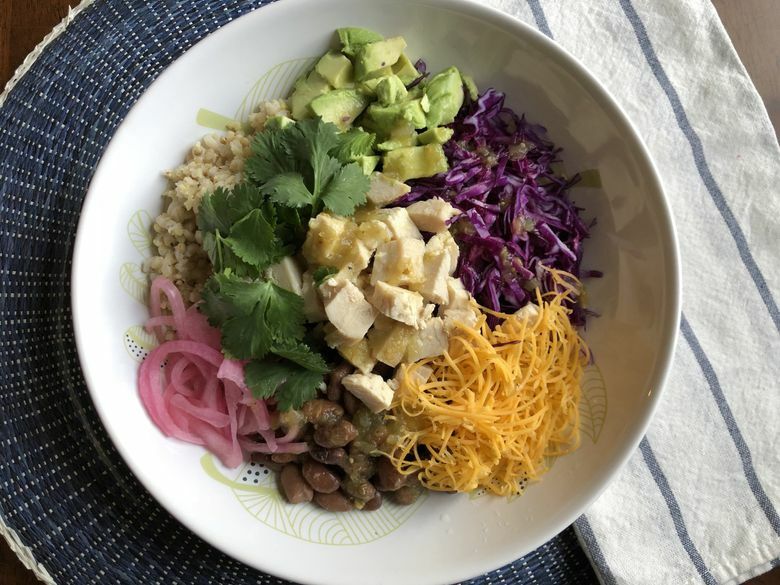 One reason grain bowls are so popular in school cafeterias and restaurants is that they’re easily customized — whether you’re tweaking a set menu item or building a bowl from scratch. Set out the components and let each eater assemble as desired. Arrange, don’t mix. Part of a grain bowl’s appeal is the visual distinctiveness of its various parts — toss it all together, and it’s no longer eye candy. Even when the flavors of each ingredient are complementary, they are also distinct from one another. With each forkful, let yourself decide which elements you want to combine. Build flavor into every part. Grain bowls can be a symphony of flavor — or dull as dishwater. A common misstep is to add sauces, seasonings and flavorful garnishes on top of unseasoned main ingredients. That doesn’t work when you aren’t mixing everything together. For the bowl recipes below, I cooked my whole grains in half chicken broth and half water (you can also use vegetable broth). The beans, cooked from dried, were brined as they soaked overnight. The Brussels sprouts were roasted with olive oil, salt and granulated garlic. The homemade hummus was flavored with garlic, lemon juice, salt, cumin and sumac. The quick-pickled red onions added a sweet-sour hit of vibrant crunch. Vary your textures and temperatures. Soft and crunchy, warm and cool, tender and crisp. When your bowl is a study in contrasts, it’s more satisfying. While you can technically make a grain bowl with any grain, I recommend whole grains, from both a nutrition and culinary standpoint. I recently attended the Oldways Whole Grain Conference in Seattle, and one of my favorite speakers was Andrea Geary, senior editor at Cook’s Illustrated and America’s Test Kitchen. She said many home cooks are reluctant to use whole grains, largely because they falsely believe that whole grains are difficult and time-consuming to cook. “Many whole grains are as easy to cook as pasta,” she said. “You boil them, you drain them, you’re done.” For example, you can cook brown rice in a big pot of water — like pasta — because the bran protects the starchy portion of the grain from becoming damaged and mushy. With white rice, however, you need to stick to an exact ratio of water-to-grain. Do you always have those ratios in your head, or at your fingertips? I don’t. As for taste? Caroline Sluyter, program director for the Oldways Whole Grain Council, points out that whole grains have a fuller, richer flavor. “They aren’t this blank slate that you have to add other things to give them flavor,” she said. An earlier version of this post misspelled Caroline Sluyter’s first name.